boeuf bourguignon – or bordelais? Boeuf Bourgignon is the best winter dinner. Pair this hearty stew with a hearty red and I could almost be fooled into thinking winter isn’t my most-loathed season. But even though it’s called Bourgignon, which means it’s from Burgundy, I usually don’t use a Burgundy to make it or even drink one with it. Burgundy’s red grape is Pinot Noir, which is a light red. I prefer to cook with and drink a bigger red, usually a Bordeaux-style blend (primarily Cabernet and Merlot). Maybe there’s some cheffy reason you should use a Pinot Noir to stew meat, but my Bordeaux makes it taste awesome. This is based on a Bon Appetit recipe, but I’ve made a lot of adjustments so here’s my revised version. SO good. Season beef generously with salt and pepper; coat with 1/3 cup flour, using all of flour. Brown beef in olive oil over high heat. Transfer meat to large bowl. Add onions and carrots to same pot and sauté until light brown, about 6 minutes. Add garlic and sauté 1 minute. Transfer vegetables to bowl with beef. Add 1 cup of the broth and the Cognac to pot; boil until reduced to glaze, scraping up browned bits, about 8 minutes. Return meat and vegetables and their juices to pot. Add wine, mushrooms, thyme, sugar, tomato paste and 2 cups broth. Bring to a boil, stirring occasionally. Cover pot and place in oven. Cook until beef is tender, at least an 1 hour 20 minutes but can be up to a few hours. Sign up for all monthly recommendations and pop culture pairings here or below! 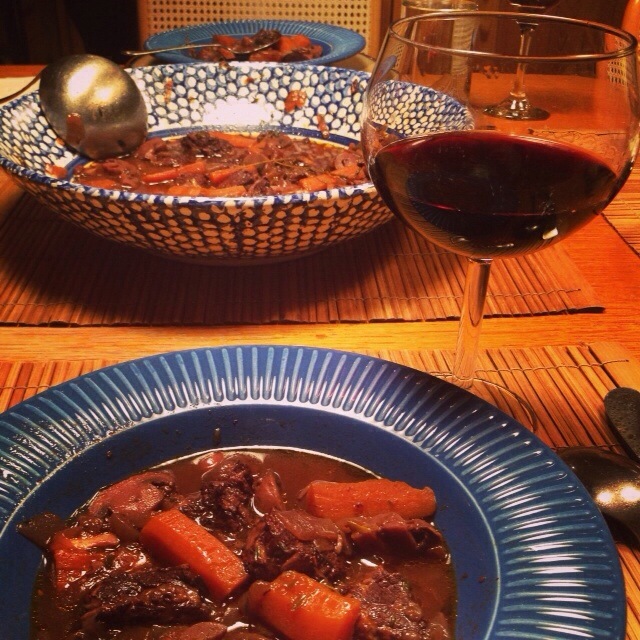 Tags: boeuf bourgignon, cabernet, food & drink, merlot, pinot noir, recipe, wine. Bookmark the permalink. Previous post ← happy decanting bear happy hour! I’m with you in enjoying a bolder red to cook with, but the coq au vin episode of Good Eats actually breaks down why cooking with Pinot Noir is the default grape: http://www.ulive.com/video/cuckoo-for-coq-au-vin (go to the 6:55 mark for the wine part, complete with visual aides!). But in all seriousness, in a dish like this I think it’s way more important to cook with the red you want to drink than fall in line with a specific varietal. Thank you! Very helpful! Will have to do a comparison of lower tannin Pinot vs higher Bordeaux blend and check out the difference. Would still want to drink a bolder red with the beef at the end, but for cooking I’ll have to explore. Cheers! My heart be still…bourguignon and merlot! Often the reblogs don’t print right, but this sounds so good, I wanted to share it. I could eat beef bourguignon 365 days a year , this is the perfect comfort food .